Blue-winged wasps (Scolia dubia) are continuing to make low-level flights over lawns in southwest Ohio. As their common name implies, the wasps have dark blue wings. Their legs and thorax are also dark blue. However, their most distinguishing features are two light-yellow spots on top of their orange-tipped abdomens. The wasps usually fly a few inches above the turfgrass, often in loops or in a figure-8 pattern. 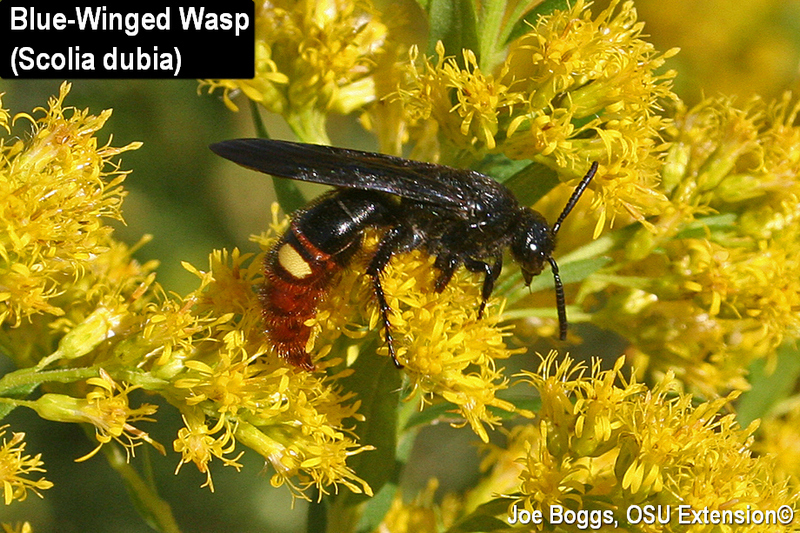 They may also be spotted landing on flowers to sip nectar, most often on common goldenrod (Solidago canadensis). There are two beneficial aspects to this wasp. It is a plant-pollinator as well as a parasitoid of white grubs with a particular affinity for green June beetle (Continus nitida) and Japanese beetle (Popillia japonica) grubs. Once a grub is located during their low-level flights, the wasp digs into the soil until it finds the grub, or it will simply enter a green June beetle grub's soil burrow. Digging through the soil is not without consequences as evidenced by tattered wings. The wasp first stings and paralyzes the grub, then it lays an egg on the grub's body. When the egg hatches, the wasp larva feeds leech-like on its hapless grub victim until the grub is no more. Their negative impact on white grub populations can be significant. Providing a good late-season nectar source, such as goldenrod, can help draw in this parasitoid wasp to draw down white grubs. It's a good example of how butterfly gardens (a.k.a. pollinator gardens) can serve as an important component in an overall pest management strategy.